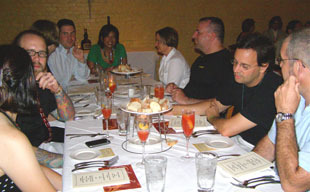 A Spirited Cocktail Pairing Dinner at the widely acclaimed Ralph Brennan restaurant, Bacco in New Orleans, Louisiana as part of the Tales of the Cocktail celebration, provided guests with the unique opportunity to experience a cocktail pairing dinner instead of the usual wine pairing dinner. 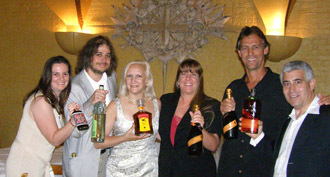 Executive Chef Chris Montero and Bar Chefs Edward F. Nesta and Debra C. Argen of Luxury Experience Company worked together on the dinner to marry a fusion of Creole and Italian cuisine with creative and complementary cocktails. 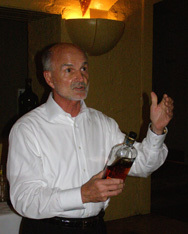 The result was an enjoyable evening of dining, cocktails, and the opportunity for the guests to meet master distillers and product representatives. Every year, as part of the Tales of the Cocktail celebration, local restaurants team up with guest bar chefs to create a special menu of culinary and cocktail pairing for one evening only. 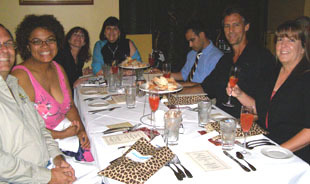 It is an event that is highly anticipated all year long and attracts local enthusiasm as well as international clientele who want to experience something unique. While wine pairing dinners are the norm these days, creating a Spirited Dinner, where each course is paired with a cocktail, is a rather new approach to dining. 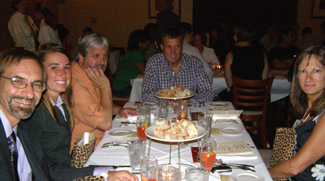 After working with Ralph Brennan's restaurant, Ralph's on the Park for the Spirited Dinner in 2008, when approached to be the guest bar chefs at Ralph Brennan's Bacco for the 2009 Spirited Dinner, Edward and I eagerly accepted. 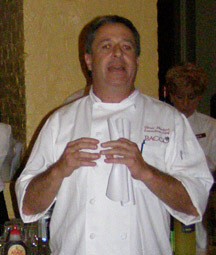 We began working months in advance when we received Executive Chef Chris Montero's ideas for the culinary portion of the menu, and then set to work creating the cocktails that would be paired with each of his courses. Using the ingredients in Chef Chris' recipes, I made a version of each course, which Edward and I sampled with each of our cocktail recipes to create the pairing. 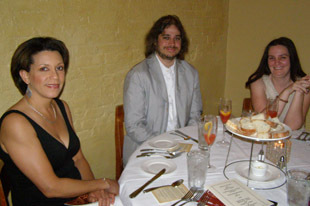 After perfecting our recipes and sending them to Chef Chris for his approval, we sat back and waited for the big day to arrive. Finally, it was July 9, 2009 and it was show time! We arrived at Bacco early in the day and met with Chef Chris Montero and his excellent kitchen team including Sous Chef Mario and First Cook Kyle, Tito and Julie who would be our bartenders for the evening, Assistant General Manager Erik Neumann, as well as Suzie, Rachel, and Hope who would help keep the dinner on schedule. Introductions complete, it was time to roll up our sleeves so to speak, and get to work creating the garnishes and making two of the more complicated cocktails that would be pre-batched and ready for Tito and Julie to pour for the 50 guests attending the Spirited Dinner. 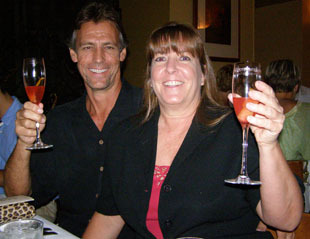 Cocktails made, it was time to go to our hotel and change for dinner. We returned to Bacco dressed for the evening, and took a final look around the beautiful Skylight Room, where the Spirited Dinner would take place. 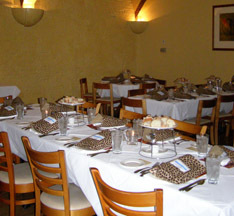 The room features a vaulted ceiling, skylights, and an authentic 18th century French Compass Point that graces a lemony wall, and admired the attractive tables dressed with white linens and accessorized with candles in glass holders, sliced bread on metal stands, and leopard print gift bags filled with an assortment of souvenirs and a Spirited Menu with Culinary and Cocktail Recipes to commemorate the evening. As the guests arrived, we presented them with the Welcome Drink, an aperitif that Edward and I created aptly named Luxury Experience's Spirit of Summer, made with Prosecco, Casoni Limoncello, Fee Brothers Pomegranate Cordial Syrup, fresh lemon juice, and garnished with a long spiral of lemon peel. Light and refreshing, with the stunning hue of a summer sunset, the evening was off to a good start. Once all of the guests were seated, Executive Chef Chris Montero welcomed the guests to Bacco and described the first course of the tasting, Panko Crusted Boudin and Seared Scallop with Wheat Beer Mustard and Louisiana Popcorn Rice Cake that would be paired with Luxury Experience's Smoke and Mirrors Cocktail made with Scorpion Mezcal 1-year old, Lime Juice, Partida Agave Nectar, Creole Mustard, Fee Brothers Whiskey Barrel Aged Bitters Limited Edition 2008, and garnished with a Lime Wheel. As the waitstaff brought the first course to the table, we described the cocktail, which we named Luxury Experience's Smoke and Mirrors that playfully referred to the smoky taste of the Scorpion Mezcal and Mirrors as we used similar ingredients in the cocktail to mirror Chef Chris' recipe. Our approach to cocktail pairing is similar to the way that a Sommelier would pair wine to a course; we look to complement or contrast flavors of each course using similar ingredients or elements in our pairings. 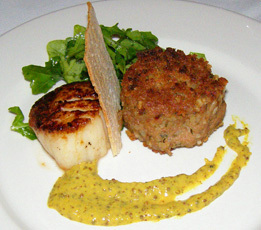 The first course was beautifully presented with a perfectly seared and golden, large scallop, and a golden, large panko crusted round boudin, divided by the rice cake, garnished with wild greens, and a wide swirl of mustard painted on the plate. Luxury Experience's Smoke and Mirrors Cocktail worked perfectly with this recipe with its hint of smokiness that complemented the smoky and spicy boudin, and the Creole mustard in the cocktail that mirrored the mustard in the culinary recipe. For the second course, Chef Chris selected Creole Tomatoes, Fresh Basil and Verbena Oil with Toasted Pinenuts and Ryals Farm Goat Cheese. Louisiana tomatoes are widely respected and these deliciously red and ripe tomatoes did the state proud. Topped with the local Ryals Farm Goat Cheese, balsamic, and verbena oil, and garnished with a large basil leaf, this course was what summer memories are meant to be, and was well paired with Luxury Experience's Green with Envy Cocktail. While tomatoes are the stars of summer, cucumbers are often the unsung heroes, which is why we paired cucumbers with Plymouth Gin, Dill Simple Syrup, and garnished the martini style cocktail with a sliced cucumber curl. For a Spirited Dinner, when one is tasting a selection of spirits over the course of an evening it is lovely to offer a palate cleanser after the initial courses to refresh the palate and prepare it for the next series of courses and cocktails. Since the dinner was part of the Tales of the Cocktail celebration, Edward and I created a grapefruit palate cleanser that included the liqueur St. Germaine and Fee Brothers Grapefruit Bitters. Served in a small shot glass and topped with candied grapefruit, Luxury Experience's Grapefruit and St. Germaine Sorbet was a light and refreshing way to prepare for the third course. 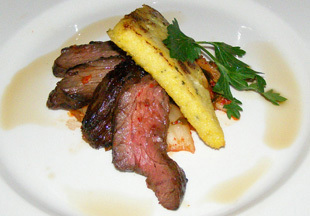 Next on the menu, was Bulgogi Wagu Hanger Steak with Kim Chee and Herbed Polenta Cake, which was artistically presented as fork tender, medium rare slices of Bulgogi Wagu Hanger Steak fanned out on a bed of kim chee with a triangle of herbed polenta. With the rich flavors of the beef and the kim chee in this course, we decided to approach the pairing rather simplistically to showcase Chef Chris' style which resulted in Luxury Experience's Modern Fashion Cocktail which we made with Bulleit Bourbon, Sweet Vermouth, Club Soda, Fee Brothers West Indian Orange Bitters, and garnished with a maraschino cherry. For the grand finale of the evening, the dessert course paired Louisiana Berry Semifreddo Crisp with Luxury Experience's Rhythm and Blues Cocktail that was made with St. Germaine, Leblon Cachaça, Fee Brothers Blueberry Cordial Syrup, Half and Half, Blueberries, and garnished with fresh Blueberries. Since the semifreddo dessert was a frozen confection, we decided to approach the pairing by creating a semi-frozen drink to complement the dessert. Luxury Experience's Rhythm and Blues Cocktail is a playful reference to both the berries used in the dessert, and well as to New Orleans long history and tradition of music. Once dinner was concluded, guests had the opportunity to taste the spirits used in the cocktail recipes neat, as well as speak with Lisa Laird of Laird and Company (Casoni Limoncello), Master Distiller Doug French and Barbara Sweetman of Scorpion Mezcal, Tom Bulleit of Bulleit Bourbon, and Steve Luttmann of Leblon Cachaça to learn more about the products. 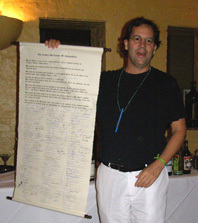 Steve Luttmann added a bit of excitement to the evening by bringing out his Declaration of Independence for guests to sign that would make Cachaça the legal international trade name, instead of being referred to as "Brazilian rum." The same way cognac may only be made in the cognac region of France, and champagne may only be made in the champagne region of France, Cachaça can only be made in Brazil and is made from fresh sugar cane juice, unlike rums, which may be made from molasses. 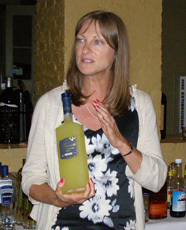 Tasting concluded, Doug French and Barbara Sweetman offered the opportunity to any guest to eat the signature scorpion at the bottom of the Scorpion Mezcal bottle. 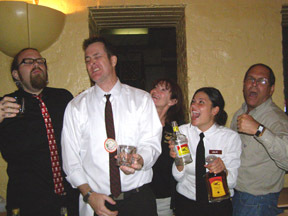 Boys will be boys, and Tito, the bartender, and James, one of the Spirited Dinner guests, readily accepted the challenge. They enjoyed it so much that they repeated the experience, which resulted in additional guests joining in to "eat the scorpion." 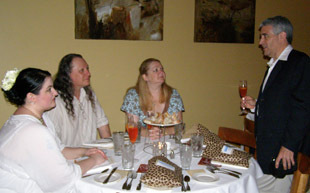 On that note, another successful Spirited Dinner ended with the guests excited about using the Spirited Dinner at Bacco Culinary and Cocktail Recipe Book to create the recipes at home. 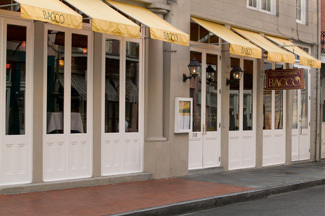 Bacco's restaurant focus is a tantalizing fusion of Creole and Italian cuisine, and is open for lunch daily from 11:30 am until 2:30 pm, and for dinner Sunday through Thursday from 6:00 pm until 9:30 pm, and on Friday and Saturday from 6:00 pm until 10:00 pm. Read Chefs' Recipes where Executive Chef Chris Montero shares his delicious recipes for Panko Crusted Boudin and Seared Scallop with Wheat Beer Mustard and Louisiana Popcorn Rice Cake; Bulgogi Wagu Hanger Steak with Kim Chee and Herbed Polenta Cake; and Louisiana Berry Semifreddo Crisp, from the Spirited Dinner. 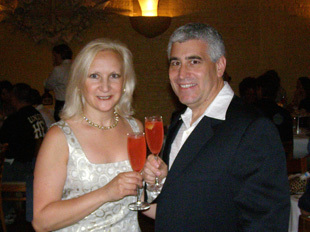 Also read the Liquor Cabinet where Edward Nesta and I share the Cocktail Recipes from the Spirited Dinner at Bacco. 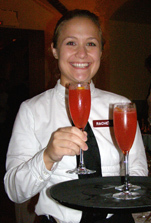 Read about Tales of the Cocktail in the Chefs' Recipes and Liquor Cabinet sections.